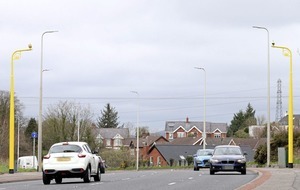 ONE of the busiest roads in Northern Ireland is to get new 'average speed' cameras in a bid to cut accidents. The Speed Enforcement Camera System (Specs) has already been installed on Saintfield Road, but is not yet operational. The main route between Belfast and south Down has been the scene of a high number of serious crashes causing severe injury or death. Ninety-seven people have been injured on the road in 59 collisions since 2013, with two people killed and 16 seriously injured. There have long been calls for traffic calming measures to be brought in as it features a sharp bend, with car and lorries often travelling at speeds higher than the 50mph limit. Elected representatives have also expressed concern about increasing traffic in the area, where around 1,000 new homes are being built. Until now it has had a fixed safety camera, located at a part of the road with a slower 40mph limit and only covering one side of the carriageway. Specs are highly visible and mounted on over-hanging poles in pairs to measure the average speed which a vehicle travels between two points, preventing drivers merely slowing down briefly before speeding up again. There is already one operational on the A2 between Bangor and Holywood. 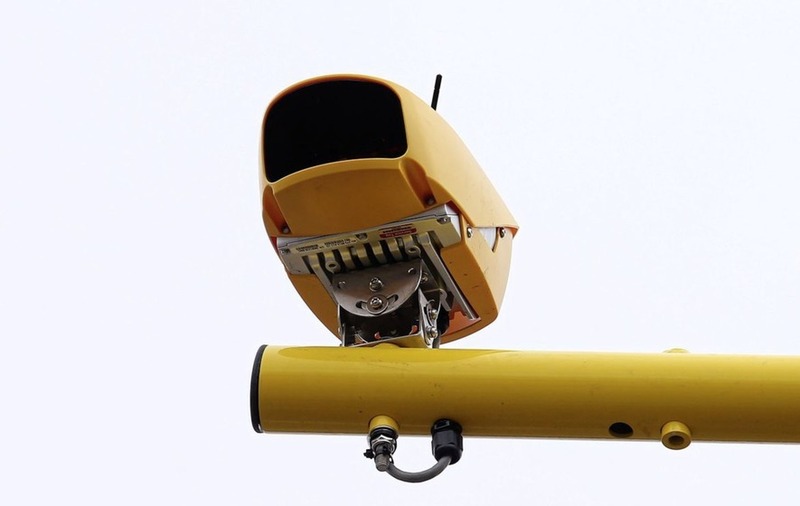 The sudden and eye-catching appearance of the new cameras has led to speculation that they are a new technology which can catch drivers committing a whole range of other offences, including using mobile phones at the wheel, not wearing a seatbelt or eating and drinking while driving. 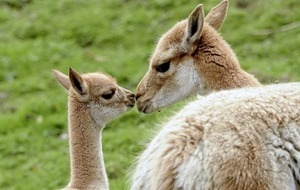 However, a PSNI spokesman said the system "only monitors and detects speeding offences". "In response to the KSI collision history and significant public concerns about vehicle speeds, the NI Road Safety Partnership is currently working on the installation of a Speed Enforcement Camera System (Specs) system on the Saintfield Road," he said. "Once installed, the system will go through rigorous testing before going live. Road users will be informed when the system is to be launched in the near future." 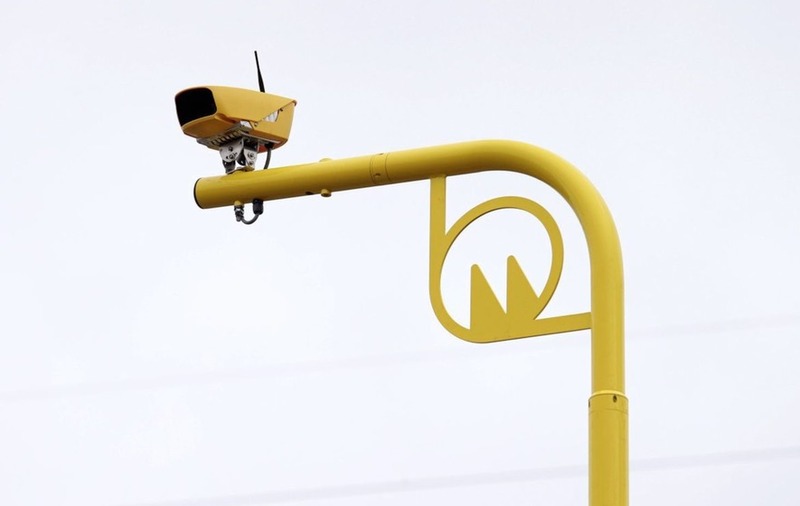 Until now there have been four fixed safety cameras around Belfast and six fixed red light running cameras in Belfast and Derry, as well as the north Down Specs. 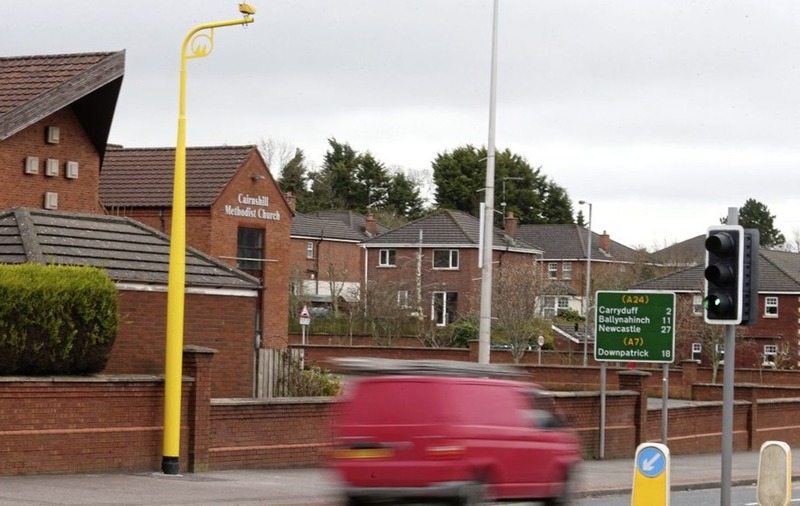 The other fixed safety cameras, which are marked yellow, are mounted at the roadside on grey-coloured poles and are around Belfast in 30mph zones on Antrim Road, Upper Newtownards Road and Springfield Road. The fixed red light running cameras, which look similar to fixed safety cameras, are at junctions with traffic lights which have a lot of collisions: Great George’s Street at the junction of York Street/ West Link, Belfast; College Avenue at the junction of Castle Street/ Millfield/ Divis Street, Belfast; Nelson Street at the junction of York Street/ York Link, Belfast; Millfield at the junction of Peters Hill/ Carrick Hill/ North Street, Belfast; Middlepath Street at the junction of the M3 on slip, Belfast and Glenshane Road/ Dungiven Road at the junction with Dennet Gardens, Derry. There are also 90 permanently signed locations where eight safety camera vehicles operate. They use the latest digital photographic and laser technology to measure and record vehicle speeds on routes throughout Northern Ireland.